Description: A reflection on simple living in natural surroundings, this ceiling fixture features a woodland pond setting as beautiful ambient light shines through Silver Mica, which is complemented with Black finished steel frame, accents and hardware. The bottom diffuser features a dramatic branches design on matching Silver Mica. 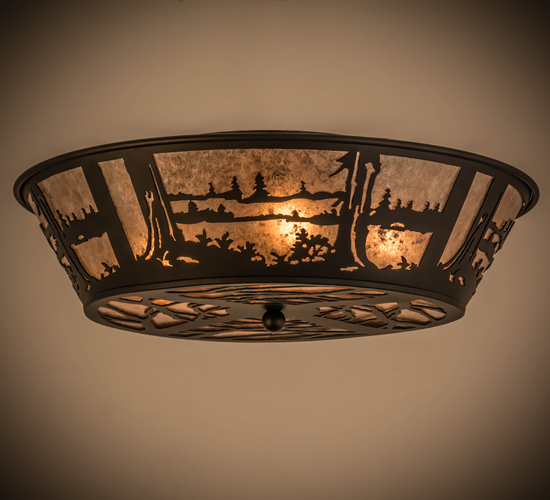 This nature inspired fixture is handmade by Meyda artisans at the foothills of the breathtaking Adirondack Mountains in the USA. Custom sizes, colors and styles are available, as well as dimmable energy efficient lamping options. This fixture is UL and cUL listed for damp and dry locations.